And that means we don’t want as much hot food or standing over a hot stove in a hot kitchen. But that does not mean you can only eat salad. Of course if you want salad – this is the time of year to add nice fresh green salads to your meals, but sometimes a salad is just not enough food. We can find the lightness in how we choose ingredients, how we proportion our meals, and how we cook. Using more leafy greens and cruciferous vegetables, avoiding heavy animal protein and limiting starch is a good way to create meals that are still high in fiber and good fats, but low in prep effort and digestive impact. Many call it a grain but it really is a seed that when cooked becomes more like a sprout. It can be used instead of a grain, since it works well in many dishes instead of rice. The thing is…it does not have much taste on its own, so the magic is in the mixture. The super power of quinoa is that it is high in protein, it is a complete protein, and it is high in omega 3 fatty acids. That makes it a food that can replace animal protein in your meal and still satisfy the need for low glycemic index and high protein meals, which often is what we crave more when we are active, spend time outside, and want to eat more lightly while still eating a full meal. The great thing about these meals (stay tuned for more to come) – is that you can bring them along and still eat well, while enjoying the outdoors. Use containers that are glass or stainless steel. If you use plastic make sure it is BPA free and does not “melt” in the heat. That said – I suggest using materials that are eco-friendly and can be re-used, recycled and re-purposed. 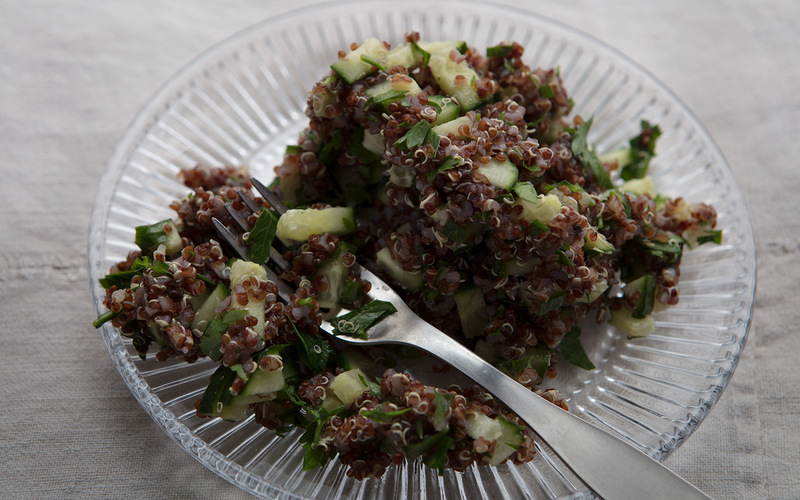 Rinse quinoa well and cook for 20-25 minutes with a pinch of sea salt. 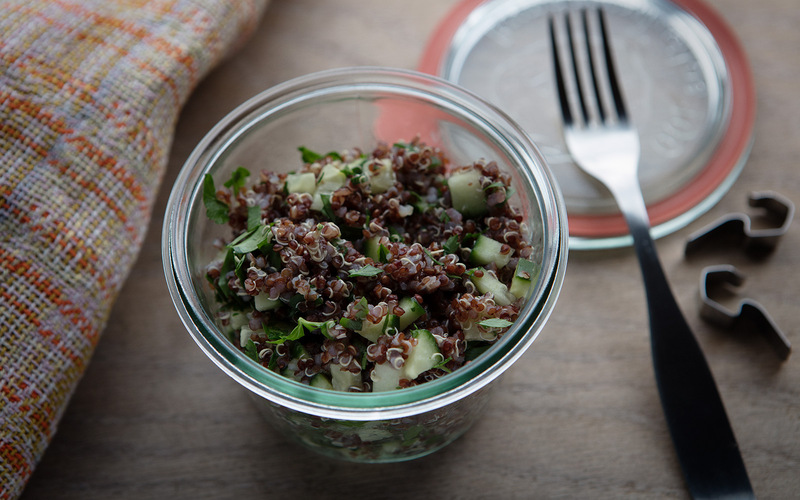 For 1/2 cup of quinoa, use 1 and 1/4 cup of water. Bring to a boil and then lower heat to a simmer. Rinse and chop cucumber and basil. Mix in a bowl with olive oil. If desired, add lemon. And as always – if you are home put your food on a plate, sit, pause, chew well, enjoy and indulge in the nourishment of your meal.